Powerful yet innovative and simple sums up the new HARDI Australia Commander. Three sensational new Commanders were unveiled in 5000, 7000 and 9000 litre capacities and marvelled by the Australian HARDI dealer network. 'We have set a new benchmark with this innovative design', said Graeme Johnson Managing Director, 'and it represents the greatest ever investment in product development by HARDI'. 'The new Commander is a powerful combination of style and performance thanks to its clever functional design'. The fluid system is managed from the trailer 'work zone', which enables unparalleled control over the sprayer during filling and cleaning. 'Two valves with easy-to-read colour coded icons on them make the fluid system simple to understand and a dream to operate', explained Ulf Thorstensson Product Development Manager. The new Commander boasts a powerful chassis design built to withstand the most rigorous conditions. Exceptional strength and low weight, combined with the new tank design provides a very low centre of gravity. The axle and chassis design gives excellent crop clearance without brake rods, suspension elements or steering components hanging lower than the axle. The 7000 and 9000 has integrated drawbar suspension and a hydraulic support leg to facilitate safe and easy attachment to the tractor. Vertical movement is absorbed by the drawbar suspension built into the chassis to reducing wear and tear on the tractor and dramatically reduce operator fatigue. 'A ground-breaking SafeTrack trapeze steering system was developed for the 5000 and 7000 trailers', explained Ulf, 'thus minimising crop damage by tracking the sprayer safely behind the tractor'. The Commander has a compact hydraulic axle suspension which provides less roll than an air suspension. 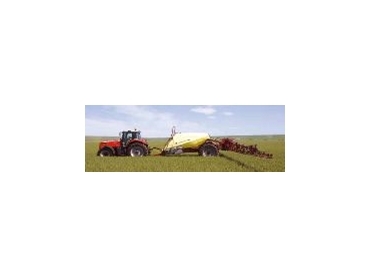 Sprayer stability is greatly assisted by the tank shape which has a low centre of gravity and sits wide over the axle. The liquid mass moves forward as the tank empties maintaining weight on the drawbar. The deep forward-sloping sump retains effective agitation even at the lowest volumes, preventing sedimentation. Many innovative features, some standard and some optional were unveiled with the new Commander. A FlexCapacity pump system with two 463 pumps for high volume liquid fertiliser applications and increased agitation is standard on the 9000 and optional on the 7000. A high capacity EasyClean suction filter with large surface area guarantees a sustained high fluid flow to the pump, and comes with a vacuum gauge, integrated ON/OFF valve and debris trap. Equally impressive is the HARDI CycloneFilter which uses a high-speed cyclonic action to reduce pressure loss in the liquid system. There are three new filling systems in the offering. The new Commander is a powerful combination of style and performance. A Venturi FastFill system powered by the HARDI 463 diaphragm pump draws fluid directly from an external source. A Filtered FastFill system uses a large capacity EasyClean filter to clean the water before entering the Main Tank. A Banjo Filtered FastFill system uses a hydraulic drive Banjo Pump with EasyClean filter. The HARDI ChemFiller is an all new high volume chemical mixing and transfer system with a lid that can be used as a sturdy work table. A combination of high vacuum and pressure Vortex nozzles efficiently mixes powders and liquids before transferring them to the sprayer. New EFC electronic fast control boom section valves with a dump valve system was developed for instant shut off. A new high-speed bypass pressure regulation system combined with LookAhead software calculates and pre-empts the correct valve settings. This is calculated in relation to the programmed rate and speed, even when not spraying. The HC 5500 is the controller and multi function processor that is used to manage sprayer functions like SafeTrack and LookAhead. 'These are some of the incredible functional features that we have incorporated into the new Commander', concluded Graeme. 'We have reached an evolutionary milestone among broadacre sprayers and I encourage you to see it for yourself'.